The Spinsterhood Diaries: More Patches and See You Soon! Well, good morning! I am sad to say that I have come down with what may or may not be turning into a sinus infection. In addition to this, this will be a full week at work. So, I had to cut out something so I could get extra rest and sleep. Unfortunately, that was blogging this week. However, I must say that I did go to the Sandy Springs Arts Festival, and it was lots of fun. I got a free massage from a massage school, and I also bought a much-needed bottle of local honey from Organic Mountains. It is divine. I've been eating it, though, in hopes that this cold was just allergies, but it the honey and all the other remedies I've tried so far haven't helped. Sigh. Above you'll see a photo of all the patches I worked on this weekend. Because my head felt like one big ball of pressure, Miranda was kind enough to sit next to me and let me watch TV instead of asking to play. These patches are the result of her kindness. I think they'll be a fun little addition to my craft fair table. 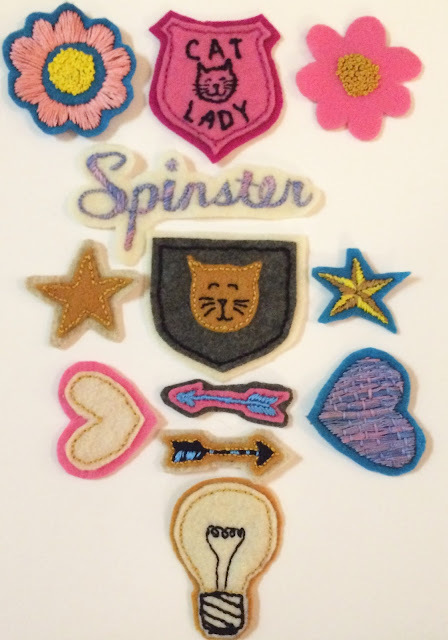 If you're dying to have one right now, though, they're available on the Etsy Spinster Store! If you an wait until the craft show, I'm not making any promises, but there may be a little craft show discount...we shall see. Happy Monday! I'll see you in about a week!